Varanasi. 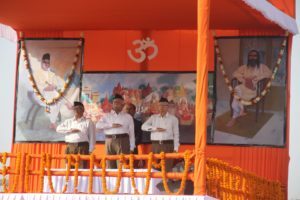 RSS Sarsanghchalak Dr. Mohan Ji Bhagwat said that the Sanatan tradition in our culture has been existing since time immemorial. We have given the world a distinct culture, civilisation, knowledge and science. That is why there is a feeling of respect towards Bharat across the world. He said RSS gatherings are organised not to assemble the crowd but to organise people for a definite aim. It is not meant to show off strength, but to achieve a goal. 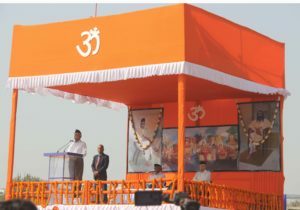 Addressing the gathering of RSS swayamsevaks on the ground of Sampoornand Sanskrit University in Kashi, Dr. Mohan Bhagwat Ji said our aim is to organise the entire society. It does not mean we want to assemble any crowd. 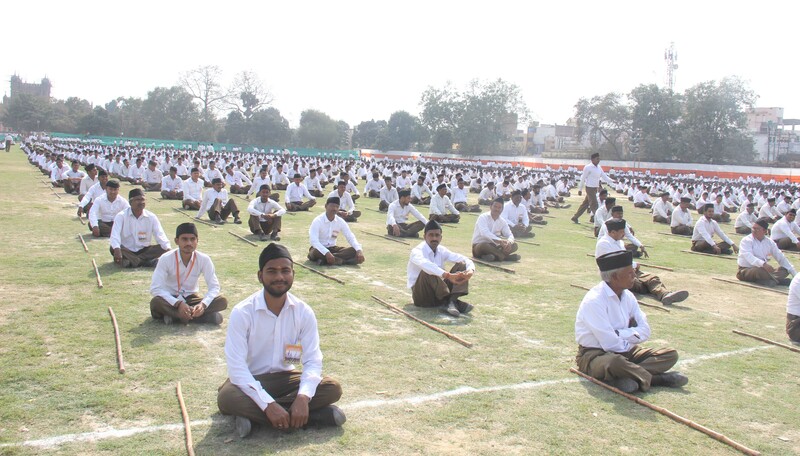 The Sangh has been organised not in any compulsion, but it is the result of sacrifice and penance of the swayamsevaks. Our aim, he said, is to build Bharat which is respected all over the world. Bharat used to be a leading country in the world economically, socially and morally till the first century AD. By the turn of the ninth century, a big decline had taken place. But even during the days of slavery, we could preserve our social values and “sanskar”. We never enslaved any country, nor did we loot any nation even though our people went as far as Mexico and Syberia in era when means of transport hardly existed. Wherever they went, they shared knowledge of Ayurveda, mathematics, science and culture. That’s why Bharat enjoys respect all over the world even today. For this excellence of Bharat, great persons like Ram, Krishna, Budhha, Mahavir and Vivekananda made their contributions. Entire world put together do not have as many great personalities as Bharat alone has. About Gandhiji, Eienstien wrote that generations to come would hardly believe that a man like him had ever existed. Any nation is not made on a piece of land, it is made by its people, its society. We should relate to the nation the way we relate to our parents. Bharat for us is not just a name, but it is our motherland with all its people and natural resources like water and forests. We can realise the concept of the nation only if we treat it like a motherland. He alerted the swayamsevaks not to let people lose the trust that people have reposed in the Sangh. He exhorted them to maintain and uphold purity in their personal, family, professional and social life. He underlined that our eternal tradition has been unity in diversity. Even today this tradition obtains in the Bharatiya society. He appealed to the swayamsevaks that while doing their personal jobs they should devote time to social works so that the Sangh activities could reach every basti and village in the country. And for this attending “shakha” should become part of our life. He said no other volunteer organisation in the world has faced as much opposition as the RSS. 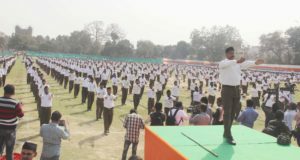 In spite of the all the opposition, the trust of the people in the RSS and its swayamsevaks has increased over the time. RSS never bore any hatred towards anybody. It always respected those who tried to malign it or spread eveil propaganda against it. Even those who disagree with us on certain points, we try to get them along as well. Every person has a responsibility towards self, his family and the society. In the life of a swayamsevak, family and society are important but his personal life is dedicated to the nation. He said collective hard work in the society would help redeem Bharat. Leaders, political parties and governments cannot help much in that regard. Till the thinking of each person does not change, Bharat will not be on its feet. In order to change the destiny of Bharat we need people who are ready to live and die for it. All should take out time to discharge their social responsibilities. Every 24 hours of a day should be divided between the self, the family and the society. Bharat would attain glory only with collective efforts of the society, he added. Kshetra Sanghchalak Virendra Prakramaditya Ji, Vibhag Sanghchalak Dr. Jay prakash Lal ji were also present on the stage.